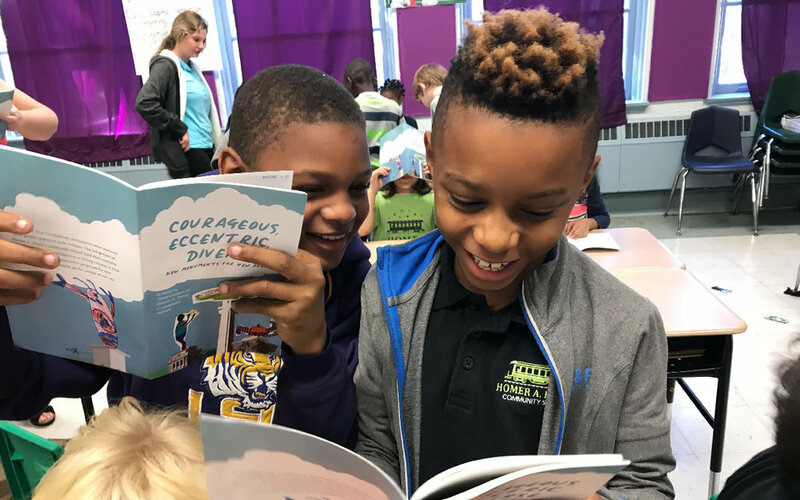 Big Class's mission is to cultivate and support the voices of New Orleans' writers ages 6-18 through creative collaborations with schools and communities. This Summer, Big Class will become 826 New Orleans when we open the doors to our brand new home, giving young writers in New Orleans a place to develop as writers, creators and thinkers. Learn more here. There Is No School Without Us contains nearly 100 student and teacher reflections and offers varying, unedited accounts of their experiences. This book is for anybody who works, attends, or cares about elementary and secondary schools in New Orleans. Written and Edited by the Young Writers Council. The Pizza Poetry Project is an annual celebration of National Poetry Month and the power of youth voice. On Pizza Poetry Day, hot pizza comes with a fresh poem by New Orleans youth ages 6-18. This collection of pizza poems commemorates five years of spreading youth-written poetry throughout New Orleans—through the unifying force of pizza. Construction of the 826 New Orleans Youth Writing Center is in full swing! When we open, the Center will allow us to double the students we serve annually through our innovative approach to literacy. Big Class offers free, high-quality creative writing programs to over 1,500 students annually, made possible by your generous support. "Last minute of class, everyone stops working and packs their bags. We’re all waiting at the door in a crowd, waiting, when out of nowhere, like a whisper in the night, we hear: 'The bell doesn't dismiss you, I do.'" Click here to read more Big Class student writing. 826 New Orleans is a chapter of the 826 National Network. Stay up to date on current programs, events, and news.